Covers St Marylebone Cemetery, Nazareth House, Convent of the Good Shepherd, Railway Station, Northway Gardens and Lyttelton Playing Fields. 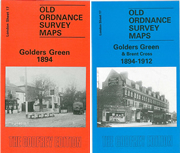 Covers Fortis Green, Alexandra Palace (part of) Railway Station, Grove Lodge, Woodside Hospital and Central Hospital. Covers Railway Station, St Mary's Church, Ducketts Common, Girls Secodary School, Cricket Ground and Belmont Recreation Ground. Covers Stonydown Gardens, Football Ground, Blackhorse Road Station. 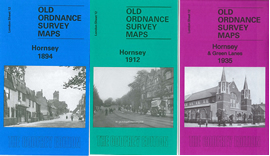 incl Wood Street Station, St Mary's Church, Forest School and Tower Hamlet area. 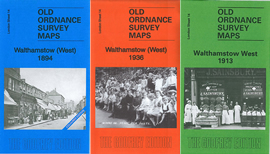 Covers Hoe Street Station, Civic Centre, Essex Technical College, Marryatt's Lodge, Walthamstow House, St Mary's Church, Upper Walthamstow and St Peter's Church. 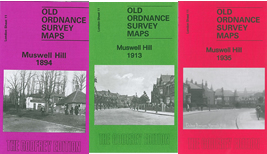 Covers Royal Wanstead School (Orphanage), Hospital, Snaresbrook Station, Malford Court, Holy Trinity Church, Sports Ground and Snaresbrook House. Very attractive map covering Highgate village, incl cemetery, stn, Fitzroy Park; also Islington workhouse, Crouchend stn, Archway.